The term ‘biodiversity’ is a contraction of ‘biological diversity’, which is being used in conservation science. ‘Biological diversity’ in its current sense began to be used in the early 1980s, with interest in the concept elevated by publications such as ‘Limits to Growth’, which discussed the implications of unrestricted population and economic growth on the environment. The term biological diversity was used by Robert E. Jenkins and Thomas Lovejoy in 1980. The word biodiversity itself may have been coined by W. G. Rosen in 1985. The term biodiversity was used as the title for a symposium organized by national Research Council in Washington in 1986. At about that time, as people became more aware of the extinction crisis, biodiversity emerged as a significant issue. Biodiversity is the variation of life at all levels of biological organization. It includes the diversity of forms right from the molecular unit to the individual organism, and then on to the population, community, ecosystem, landscape and biosphere levels. In the simplest sense, biodiversity may be defined as the sum total of species richness, i.e. the number of species of plants, animals and microorganisms occurring in a given region, country, the continent of the entire globe. Biodiversity includes diversity within species (genetic diversity), between species (species diversity), and between ecosystems (ecosystem diversity). According to WHO reports, around 80 % of the global population still relies on botanical drugs as of now biodiversity contributes significantly towards human livelihood and development and thus plays a predominant role in the well-being of the global population. The rapid decline of herbal biodiversity is the major challenge for policy makers and all other conservators. The biodiversity rapidly declines due to the exploitation by traders and collectors, natural and man-made disaster (Forest fire, unsustainable road construction etc. ), especially the diminishing valuable herbs, now already enlisted in CITES (convention in international Trade for endangered species) as threatened and near threatened species. With the decline in biodiversity the impact is felt in agronomy of hill farmers. Further, increasing global warming, climate change have made mountain communities vulnerable. The traditional healing practices hence find difficult in access to these valuable herbs for cure in hinterlands of Mountain communities. This also greatly impact the seekers of Ayurvedic treatment for health cure around the globe. This has been observed globally that the potential benefits of plant-based medicines have led to unscientific exploitation of the natural resources. The major responsible factors towards this decline are rise in the global population, rapid and sometimes unplanned industrialization, over-exploitation of natural resources, indiscriminate deforestation, pollution, and finally global climate change. Therefore, it is of utmost importance that plant biodiversity is preserved, to provide future structural diversity and lead compounds for the sustainable development of human civilization at large. Owing to a high subsistence economy, livelihood is unsustainable thus resulting in youth migration and drudgery. Especially with per capita land holding very meagre (half to one acre) agro-outcome and remuneration remain paltry, which is further exacerbated from present climate change. There is a multi-fold jump in the demand for the herbal products in country where the existing natural production is not sufficient to serve the demand. So it has been desired to engage in the herbal endeavour, especially amongst the remote upstream communities residing in the harsh and challenging cold temperate and subalpine climate zones. 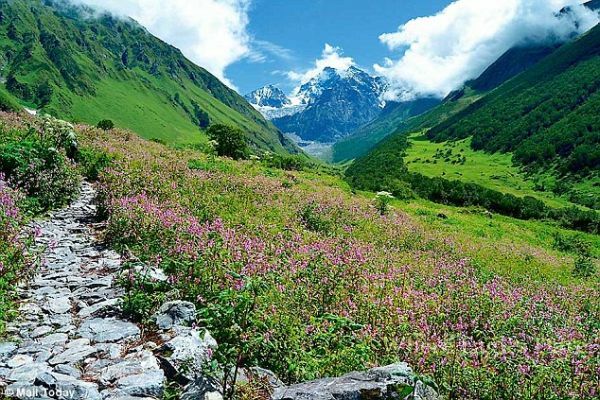 Herbal cultivation (ex-situ – outside of the natural habitat), conservation, propagation for the need of health care and replenishment valuable/pivotal floral diversity. Implying under low volume (owing to meager landholding) but the high value (for enhanced livelihood remuneration) for sustainable, improved agriculture. Integrated project on technological transfer under protective condition from seasonal and off seasonal vegetable cultivation to germination and growing of endangered herbs in greenhouses and farmlands. Collaborated with the scientists from HAPPRC (High Altitude Plant Physiology Research Centre), HNB Garhwal University (Central University) for scientific and capacity strengthening of communities. Identified two important species (Kutki – Picrorhiza kurroa, Kuth – Saussurea costus, these are CITES listed endangered and critically endangered species, respectively) for herbal promulgation, economic and ecology sustenance. Facilitated efforts under applied research from lab/demonstration centres to farms. Enabled tripartite efforts between farmer, HAPPRC, Trader for insured qualitative and successful trade. Sensitized public policies towards herbal cultivation and enabled access to government schemes for multiplication of herbal endeavour. Facilitated National & State Medicinal Plant Board along with state’s Herbal Research Development Institute in reaching out to the farmers by registering these as herbal producers, outreach govt. schemes for herbal cultivation and marketability of enlisted species. Knowledge transfers of Farmers from 10 in beginning are today spread across multi catchment in various watersheds of the region with hundreds of farmers practicing herbal cultivation. Formed farmer cooperative in hinterlands as a registered exporter. The cooperative has self-traded the herb to Germany, England and US. The farmers have enhanced earning from Rs.250 in 2003 to Rs.1500 per kg presently in the national and international market. Sensitisation of the Catchments, today they are enabling self-efforts to the conservation of herbal species in natural habitat and multiplication of these further in respective farmlands. To ensure the benefits of the farmers, UYRDC has collaborated with progressive organisations within the country and overseas for further strengthening herbal conservation, propagation and trade with multitude objective of conservation, multiplication, ecology balance of valuable flora and economic sustenance of farmers. Recently UYRDC has partnered with Dunagiri Foundation is facilitating qualitative trade and promulgation of endangered herbs of high altitude farmers in District Chamoli, Uttarakhand State, India. The initiative is promising as it addresses not only environment and economic returns but also seeks an answer to rising migration of youth from remote high altitude hinterlands, thus providing potential answers to the socio-economic development of mountain community. UYRDC has pioneered in the field of Ex-situ cultivation, conservation and propagation of Medicinal Plants especially the endangered valuable herbs. Began in year 2001 organisation has pursued the goal of community self-reliance with self-motivation to the conservation of natural habitat. The pivotal herbs Picrorihiza Kurrao (Kutki) & Sausurria Costus (Kuth) have been successfully germinated & propagated by farmers in high altitude (cold temperate & sub-alpine climate zones) villages. Today village Ghes in Deval development block of District Chamoli, Uttarakhand has won innumerable accolades for the cultivation of rare herbs and conservation of these herbal biodiversities. In the year 2009, the farmers formed the cooperative “Kamgar Swayat Sahkarita” to export these herbs to national and international markets. The same year the cooperative sold the herb to Germany. Since then UYRDC has been extending cooperation to numerous farmers across multi watershed regions of the fragile ecosystem. In the year 2015, UYRDC extended cooperation to Village Ramani voluntarily to enable in sustaining their efforts. Here at Ramani we integrated with Ankur’s efforts and self-connected farmers with an American organisation (also a foundation by the name Dunagiri Foundation) to trade their harvested Kutki. The efforts were fruitful as the trader/organisation self-engaged with the farmer and supported resources to cleans, dry and package there Kutki & Kuth. They have taken along with them 90 Kg Kutki & 27 kg Kuth. The Organisation has come back this year and is presently at Village Ramani to see through this year’s Harvest. Last year Kutki was sold at Rs.1500/kg & Kuth at Rs.350/kg. UYRDC has achieved a major milestone in the herbal endeavor. The Ghesh village was being harvested in the month of October 2015. The American organization Dunagiri Foundation collaborated with England herbal organization “Pukka Herbs” for the trade of Kutki to Bristol, England. UYRDC through its established farmer cooperative Kamgar Swayat Sahakrita enabled the execution of the entire value chain right from the harvesting, clipping for rhizomes, pressure washing the rhizomes, drying, packaging, coordinating with forest department & HRDI, acquiring all the important documents at the district (Legal procurement Certificate) & at Delhi (CITIES Export Permit – permission to export endangered listed herb), shipping to cargo agency and exporting to Bristol, England. The initiative this time was a landmark in many ways. One of the new activity was bringing the pressure washer for cleansing the Kutki rhizomes. The Kutki reached Bristol in July 2016. This October Kutki shall be harvested at Ghesh again. The price offered was Rs.1500/kg, which shall follow for the coming years as well. The market for herbal products is booming with demand but the supply is constant because of the above-mentioned challenges. The interest of the farmers was declining because of lack of knowledge, market linkage, innovation, farming equipments and other technical support. Through the continuous hand-holding support of the organization, these farmers have been provided the capacities with all required know-how and got connected with different stakeholders which enhanced their capacity as well as the earnings. These initiatives have a positive impact on the livelihood of the community through sustainable production of herbal products, which is also contributing to biodiversity conservation.